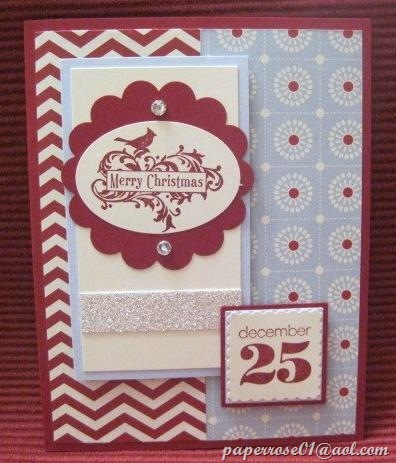 The last card we will be making at the December Stamp Camp is the Holiday Ornament card. This elegant Midnight Muse and Whisper White card uses the wonderful Ornament Keepsake Bundle. 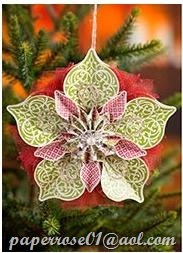 You can stamp any of the larger ornaments from the Ornament Keepsakes set and die cut them with the Holiday Ornaments Framelits Dies. Page 3 of the Holiday Catalog shows both the stamp set and the framelits. Although we embossed this with the Perfect Polka Dots embossing folder, any of the Stampin’ Up Embossing Folders could be used. We added a bit of Midnight Muse stitched satin ribbon to smoothly tie the card components together. 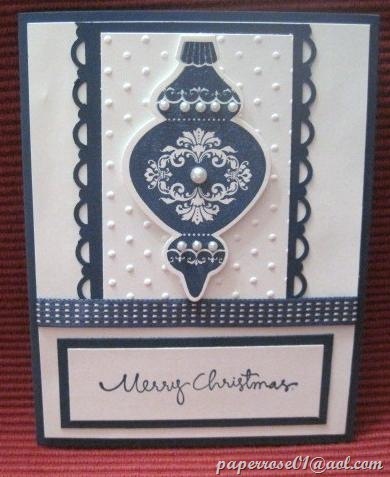 When Debbie designed this card, she added a touch of elegance to the ornament with the use of pearls. Rhinestones will also be available for use if preferred. I hope you can come to our December Stamp Camp. The cost for the 5 cards is $12.00 and you can purchase a kit if you are unable to attend. Debbie and I will be available to assist as needed. I know some of you are on tight time schedules, and we will do as much as we can to help you complete your cards quickly. Please give me a call at 630.759.3089 or drop an E-mail to paperrose01@aol.com with any questions or concerns you might have. Evergreen was my interpretation of the Christmas card shown on page 18 of the Holiday catalog. Of course now that I look at the card, I see that the star is a bit off kilter – but the hand-made look is what makes our cards so special. I found the embossing for “Silent Night” sentiment to be a bit challenging, so I went ahead and did the embossing for you. 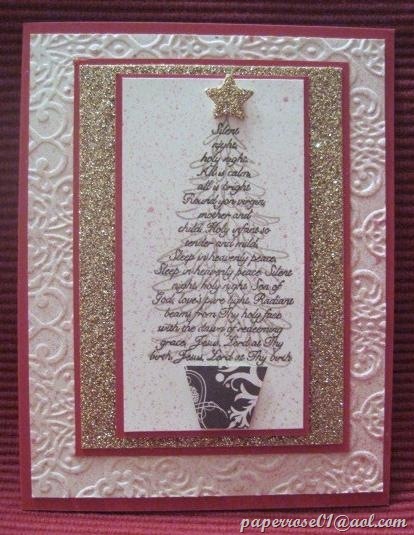 There is a lightly stamped tree image that is overlaid by the embossed sentiment. I also pre die-cut the star and the tree holder. Of interest was a gentle mist of Blushing Bride Shimmer Smooch Spritz on the vanilla cs. I also did another sample and misted it with Vanilla Shimmer Smooch Spritz. You can choose either Spritz, or perhaps none at all. The new Lacy Brocade Textured Embossing Folder provides an interesting background for this Red Riding Hood Card. This is just one of the five cards we will be doing at the December Stamp Camp – Friday December 7th from 3 PM – 8 PM and Saturday December 8th from 8 AM – 4 PM. We have earlier than normal start times each day to accommodate your busy schedule. It would be helpful to know if you plan on coming. You can give me a call at 630-759-3089 or drop an E-mail to paperrose01@aol.com. However, as we always have extra kits prepared, feel free to stop by if you find you have the time. Our cost this month is $12 for the 5 cards. You can also order a kit if you can’t make the stamp camp. These are beautiful cards! The watch is ticking! Can you complete this card in just 15 minutes? All the work has been done for you – all you have to do is put it together. In fact, if you don’t complete this card during the December Stamp Camp, you can easily finish it at home – in less than 15 minutes! These are really nice as the DSP does most of the work for you! I had lots of fun making these 15-minute samples. I used 4 1/2 X 6 1/2 DSP from the Festival of Prints Designed Series Paper Stack – 48 double sided sheets for $6,95. I trimmed the sheet to 2 panels at 5 1/4 X 2 and flipped one panel over to use the other design. I included a strip of Glimmer cs, a stamped very large oval, a stamped postage stamp, square, a 2 3/16” scalloped circle, and 1 – 1 1/4” square, and a 1 3/8” coordinating cs square. I pulled an assortment of DSP for the December Stamp Camp kits – I wonder what yours will be????? 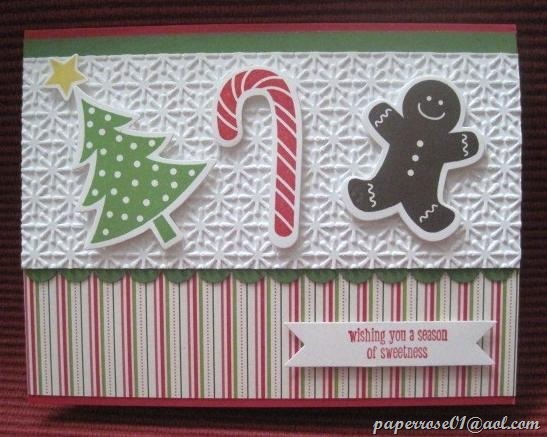 This is truly an easy card – no ribbon, no embossing, no die cutting – NO BIG SHOT!!!! Hope to see you Friday – 12/7 or Saturday 12/8. The cost this month is $12 for 5 cards. If you can’t make it, let me know and I will reserve a kit for you to stop by and pick up at your convenience! This second sample of Scentsational Season is just a bit different. We’ve used a red glimmer star and added a second scallop edge border. 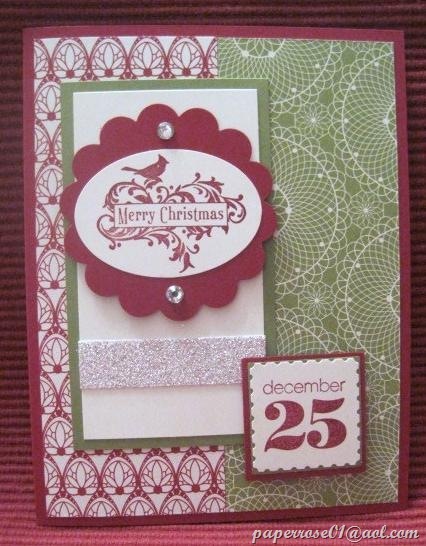 The Lacy Brocade embossing folder adds an unusual background. 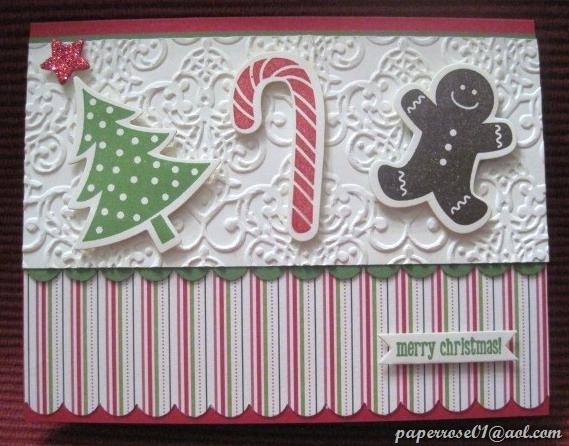 At our Christmas Stamp Camp, stampers can choose any available embossing folder for the vanilla background. A choice of red, silver, and champagne glimmer cs will be available for the star of your choice. Hope you can come to this special Stamp Camp. Our cards are varied and very special. Friday, December 7th from 3 PM – 9 PM and Saturday, December 8th from 8 AM – 4 PM. Our goal is to make this a 2-hour stamp camp as we know everyone is exceptionally busy during this time of year! Check back in the next couple days for more Christmas Stamp Camp samples.